H2O Seafood Grill is the ideal spot for private parties. Two rooms are available for hosting catered events. 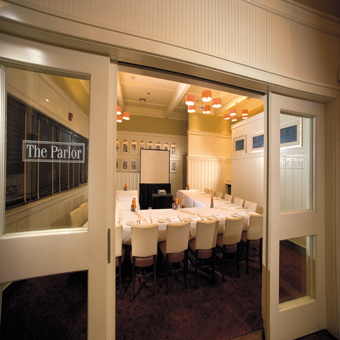 The Parlor boasts clean lines, cream and sage accents and etchings of the Long Island shoreline. The Main Dining Room exudes a classic New England ambiance with vintage nautical photographs complementing the rich wooded decor. H2O offers customized catering packages for corporate events and personal celebrations. Skilled event planners ensure a flawless experience. A sushi bar features creative sushi and sashimi platters coordinated with Japanese beers and sake. An extensive wine cellar offers perfect accompaniments to any meal. Visit once and you will be hooked.